A new world ... vast lands as far as the eye can see ... Your ship engages on a river whose fertile banks are your new home. Expand your boundaries, build your territory and exploit the resource deposits to build the various buildings that will make your most prestigious settlement in the region. 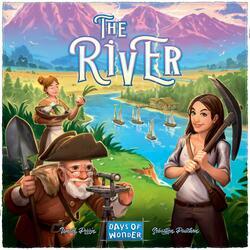 In The River, players compete in order to have the most beautiful colony in this new world. In order to outdo your neighbors, bring majestic buildings out of the ground and develop the banks of your river in a harmonious and productive way. Store resources, expand your territory, block your direct competitors ... Every action counts in this fluid and fast placement game. And beware: as you explore, some pioneers will eventually settle in and the lack of manpower may cost you the victory.